So many bicycles, so little space. There are virtually hundreds of bicycle manufacturers throughout history. Below we have listed the major brands we sell along with a short description of each. We wish we could put our inventory online but for now, we'd love for you to stop by and browse our selection yourself. After all, it's the best way to choose your bike. Cervélo Cycles is a Canadian manufacturer of racing bicycle frames. The company was founded in 1995 in Toronto by Phil White and Gérard Vroomen, who continue to run the company. Cervélo uses CAD, computational fluid dynamics, and wind tunnel testing at the San Diego Air and Space Technology Center, in California, USA, to aid its designs. Frame materials include aluminum and carbon fibre. Cervélo currently makes 3 series of road bikes: the R series, featuring multi-shaped, "Squoval" frame tubes; and the S series of road bikes and P series of triathlon/time trial bikes, both of which feature airfoil shaped down tubes. The company also manufactures T series track bikes. Cervélo frames are made in China. Cervélo's sponsorship of elite athletes has led to widespread recognition of the brand. In 2003, Cervélo became the bike supplier to Team CSC, at the time the 14th team on the world ranking. 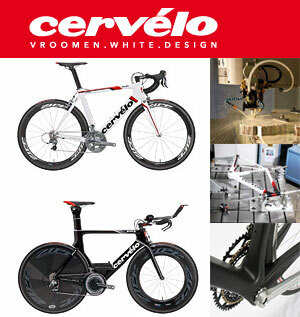 Cervélo was by far the smallest and youngest bike company to ever supply a team at this level. Team CSC has been crowned the worldÕs #1 pro cycling team aboard Cervélo for three years. The partnership lasted for six years, until the end of 2008. In 2009, Cervélo became the first bike manufacturer in the modern era to have its own cycling team at the highest levels of racing, Cervélo TestTeam. The team had a stated goal of not only competing successfully on the international level, but also encouraging collaboration between the team members, Cervélo, and other product sponsorship partners in order to develop better products. There was also a strong focus on fan interaction and experiences. The team's most renowned riders were 2008 Tour De France winner Carlos Sastre and current World Champion and 2009 TdF Green Jersey winner Thor Hushovd. Heinrich Haussler also took many of the team's headlines, with his impressive performances at ParisÐNice, Milan Ð San Remo, and his stage win in the 2009 Tour de France (Stage 13, Colmar). In 2010, Emma Pooley and Thor Hushovd won the UCI Women's Timetrial and UCI Men's Road Race respectively. Success was also achieved in a number of ITU Triathlon Races and the Ironman 70.3 and long distance events. For the 2011 season Cervelo have joined forces with Slipstream sports to form the Garmin-Cervelo team which also includes a women's team. Today, Cervélo SA is the worldÕs largest manufacturer of time trial and triathlon bikes, as determined in industry counts including decisive wins for the past four years at the prestigious Kona bike count. The winner of the 2008 Tour de France, Carlos Sastre, did so on a Cervélo. At the Beijing Olympics Cervélo bikes were ridden by over forty remarkable Olympic athletes, resulting in three Gold, five Silver and two Bronze medals Ð a record. In 2011, the Cervélo S3 received numerous awards from cycling publications including being selected as Editors' Pick in VeloNews' Aero Road Bike Test and Best Race Bike in the Bicycling Magazine Editors' Choice Awards. 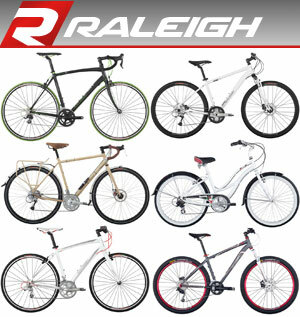 The Raleigh Bicycle Company is a bicycle manufacturer originally based in Nottingham, UK. It is one of the oldest bicycle companies in the world. From 1921 to 1935 Raleigh also produced motorcycles and three-wheel cars, leading to the formation of the Reliant Company. Raleigh's history started in 1887, in Raleigh Street, Nottingham. Frank Bowden, a prosperous 38-year-old, bought a bicycle made by Messrs. Woodhead, Angois and Ellis, because his doctor had told him to ride a bicycle for his health. Bowden was impressed by his bicycle and went to Raleigh Street to find the makers. Woodhead, Angois and Ellis were making three bikes a week. Bowden made them an offer and bought the business. Production rose and three years later he needed a bigger workshop, which he found in a four-storey building in Russell Street. He changed the company's name to Raleigh Cycles to commemorate the original address. In six years Bowden created a business which became the biggest bicycle manufacturing company in the world and occupied seven and a half acres in Faraday Road, Lenton, Nottingham. Sir Frank Bowden died in 1921 and his son Sir Harold Bowden, 2nd Baronet took over as chairman and chief executive, guiding the company through the next 17 years of expansion. In 1939 Raleigh opened a bicycle factory at 6 Hanover Quay, Dublin, Ireland and commenced bicycle production there. The Raleigh (Ireland) business expanded and moved to 8-11 Hanover Quay, Dublin in 1943. The plant produced complete bicycles and Sturmey-Archer hubs, and remained in production until 1976, when the factory burned down. Models produced there latterly were the Chopper and Triumph 20. The head badges changed in the late 1960s, possibly after the passing of the Trade Descriptions Act in the UK. Dublin-made machines no longer had "Nottingham England" on the Heron or Triumph head badge, the panel being left blank instead. In 1979, production of Raleigh 531 butted-tube bicycles reached 10,000 units a year. In 1982, rights to the Raleigh U.S.A. name were purchased by the Huffy Corporation. Under the terms of the agreement, Raleigh of England licensed Huffy to design and distribute Raleigh bicycles in the USA, and Huffy was given instant access to a nationwide network of bike shops. The renamed Raleigh Cycle Company of America sold bikes in the US while the rest of the world, including Canada, received Raleigh of England bikes. At that time, production of some Raleigh models were shifted to Japan, with Bridgestone manufacturing most of these bikes. By 1984, all Raleighs for the American market, except the top-of-the range Team Professional (made in Ilkeston) and Prestige road bikes (Made in Nottingham), were produced in the Far East. In 1987, Derby International bought Raleigh USA from Huffy. Today, Raleigh Cycle Company of America parts and frames are mass-produced in China and Taiwan for Derby and assembled in other plants. Raleigh of Denmark still offers traditional rod-brake models. The Schwinn Bicycle Company founded by German-born mechanical engineer Ignaz Schwinn (1860–1945) in Chicago in 1895, became the dominant manufacturer of American bicycles through most of the 20th century and is now a sub-brand of Pacific Cycle, currently owned by the multi-national conglomerate, Dorel Industries. Ignaz Schwinn was born in Hardheim, Baden, Germany in 1860 and worked on two-wheeled ancestors of the modern bicycle that appeared in 19th century Europe. Schwinn emigrated to the United States in 1891, where he found similar difficulties. In 1895, with the financial backing of fellow German American Adolph Arnold (a meat packer), he started the Arnold, Schwinn & Company. Schwinn's new company coincided with a sudden bicycle craze in America. Chicago became the center of the American bicycle industry, with thirty factories turning out thousands of bikes every day. Bicycle output in the United States grew to over a million units per year by the turn of the century. By 1990, other U.S. bicycle companies with reputations for excellence in design such as Trek, Specialized, and Cannondale had cut further into Schwinn's market. Unable to produce bicycles in the U.S. at a competitive cost, by the end of 1991 Schwinn was sourcing its bicycles from overseas manufacturers. 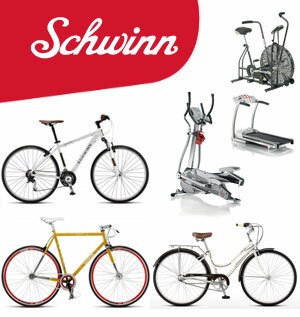 Seeking to increase its brand recognition, Schwinn established additional company-operated shops, a move that alienated existing independent bike retailers in cities where the company stores had opened. This in turn led to further inroads by domestic and foreign competitors. Faced with a downward sales spiral, Schwinn went into bankruptcy in 1992. The company and name were bought by the Zell/Chilmark Fund, an investment group, in 1993. Zell moved Schwinn's corporate headquarters to Boulder, Colorado. In late 1997, Questor Partners Fund, led by Jay Alix and Dan Lufkin, purchased Schwinn Bicycles. Questor/Schwinn later purchased GT Bicycles in 1998 for $8 a share in cash, roughly $80 million. The new company produced a series of well-regarded mountain bikes bearing the Schwinn name called the Homegrown series. In 2000 Andrew Schwinn, great-great-grandson of Ignaz Schwinn, was brought in as a business consultant to bring new ideas to the company. However, it was not enough, and in 2001 Schwinn/GT declared bankruptcy. On September 11, 2001, Schwinn Company, its assets, and the rights to the brand, together with that of the GT Bicycle, was purchased at a bankruptcy auction by Pacific Cycle, a company previously known for mass-market brands owned by Wind Point Partners. In 2004 Pacific Cycle was, in turn, acquired by Dorel Industries. Schwinn sells essentially two lines of bicycles. 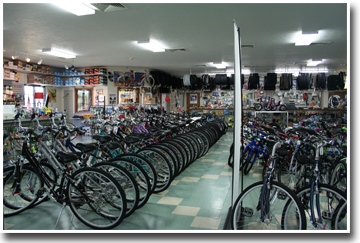 One is a line of discount bikes offered through mass-merchandisers like Wal-Mart, Sears and Kmart. The other line, featured on the website, are higher end models sold through specialty shops. 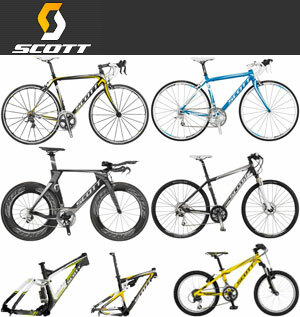 The Swiss company SCOTT Sports SA (formerly Scott USA) is a producer of bicycles, winter equipments, motorsports gear and sportswear. In 1958, engineer and skier Ed Scott from Sun Valley, Idaho invented a ski pole made of aluminum, which compared favorably to those made of bamboo or steel. On the basis of this success, the company started to produce many kinds of sports goods. In 1970, Scott sold their first protection goggles for motocross riders; further motocross wear followed. Scott expanded to Europe in 1978, settling their headquarters in Fribourg, Switzerland. The first mountain bike was produced in 1986, but more important was the invention of an aerodynamic handlebar, with which cyclist Greg LeMond won the Tour de France, only eight seconds ahead of Laurent Fignon. Today, this form of handlebar is obligatory for most time trial races and is also used in triathlons. In 1991, Scott produced the first suspension fork named "Unishock" and a year later, the first full suspension mountain bike was shown to the public. The racing bicycle sector expanded continuously and in 2002, stage 10 of the Tour de France was won by Patrice Halgand riding for the Jean Delatour team, which was at that time supported by Scott. Today, Scott supplies Team Columbia-High Road with equipment. The name 'Scott USA' was changed to 'Scott Sports', representing a shift in emphasis to the European market. 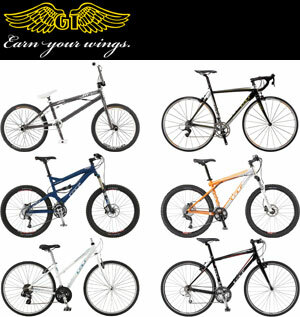 GT Bicycles is a large American manufacturer of road, mountain, and bmx bicycles. The company was founded in 1979 by Gary Turner, a welding engineer and Richard Long, a bike shop owner. The company merged with Schwinn (Questor Partners) in 1998, but the conglomerate went bankrupt in 2001, and was acquired by Pacific Cycle. Dorel Industries acquired Pacific Cycle in 2004. GT itself acquired Auburn Racing and Dyno Products from Bob Morales plus Robinson Racing from the late Chuck Robinson in the late 1980s. GT is directly administered by Dorel although the Dyno label has been resurrected and is part of Pacific Cycle. GT mountain bikes are often readily identifiable by the "triple triangle" frame design present in most hard-tail designs. Early BMX frames were also easily identifiable as the top tube seemed to bisect the seat tube and protrude beyond it by approximately an inch-and-a-half towards the rear of the frame. This innovative idea was claimed to reduce the amount of vibration transferred to the seat from the rear wheel. Later versions would actually have the customary "GT" letters stamped on the end of the protruding tube. 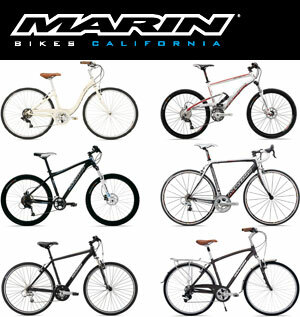 Marin is a bicycle manufacturer in Marin County, California, established in 1986. It specializes in mountain bikes but also has other types. All 68 bicycles are named after locations in and around Marin County. Since the late 1990s Marin has manufactured full suspension mountain bikes. Working with Jon Whyte, a British engineer who worked with Benetton Formula One racing cars in gearbox design, Marin developed a single-pivot rear suspension. Subsequent innovations including the TARA (Travel And Ride Adjustable) and quad link suspensions have lost the purity of the original concept but have maintained their popularity. Marin offer mountain bikes (full suspension & hardtail), road, street/urban, comfort and specific designs for women & children generally placed in the mid-high end bracket of each respective market.